Here are roster questions for the Western Conference. A lot of teams are expecting a key player to have a bounce-back, or breakout season in order to keep up in the ultra-tight conference. Like last year, there are only a few teams that are a lock to make the playoffs, so teams need all players playing at their best to have a shot at the post-season. Chicago Blackhawks – Can Andrew Brunette still be a top-line player? There are few questions on a Blackhawks team that had its greatest needs, defense and toughness, met in the offseason. One thing to keep on eye on is the production of Brunette who had 18 goals and 46 points last season, his lowest totals since the lockout. The 37-year-old has never been the swiftest skater, but Brunette has always found a way to hang with the quicker guys and playing with Jonathan Toews and Patrick Kane would be a shot of adrenaline for anyone. His goal total likely won’t go up much, but with his soft hands he should break 40 assists again and be a steady influence for the young stars. Columbus Blue Jackets – How does Jeff Carter react to his trade? At least Mike Richards can take comfort in being traded to a Kings team that has the pieces to be a Stanley Cup contender, but Carter is going from a team that reached that Stanley Cup final a year ago to a team that hasn’t won a playoff game in its 10 seasons. So will he be determined to prove Philly faulted in trading him or will he be too bummed to be of any use? While he is the elite center Columbus has always needed to play with Rick Nash, their styles may be too similar; putting two goal scorers together doesn’t always mean success; look at the combination of Olli Jokinen and Jarome Iginla in Calgary. Carter will once again have to score near 50 goals, something he hasn’t done in three seasons, to help the Jackets rise in the standings and there is no better way to do that than to be anxious to prove Philly wrong. 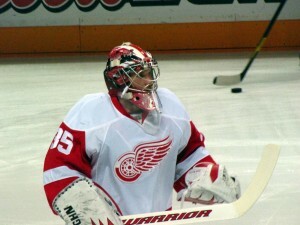 Detroit Red Wings – Does Jimmy Howard put it all together? The current version of the Red Wings are no where near the caliber they were only a few years ago when they had Hall of Famers on the ice seemingly every shift, but they are still one of the strongest teams in the Western Conference. Now the defense is another year older and there are only three quality scorers, they need Howard to be more consistent. He had an up and down year and his stats weren’t as good as the season before, but put it together in the playoffs. If he can keep up that level of play throughout the season, the Red Wings, needing strong goaltending now more than in recent memory, will be just fine. Nashville Predators – Does Niclas Bergfors finally turn into a goal scorer? The Devils drafted Bergfors in the first round of 2005 for his scoring potential, which we have seen small samples of. But after only one goal and seven points in 20 games for Florida after a trade last season, he was allowed to walk and signed with Nashville, a team that desperately needs offense wherever it can find it. For that reason Bergfors, entering his third full season, will get every opportunity to prove he can put the puck in the net. He scored 21 goals as a rookie, so the capability is there, he just needs to play a more consistent game and get to the tough areas more often. St. Louis Blues – Will David Perron play this season? The Blue have the potential for a dangerous offense, not because of any superstars, but because of their ability to roll out three solid, consistent lines. But once they lose that depth, they get into trouble. Perron, T.J. Oshie and Alex Steen all missed time with injuries last season. Perron’s was the worst as he suffered a concussion after a hot start and still isn’t fully recovered. He is the Blues’ most natural goal scorer and had them at a 7-1-2 record with five goals and seven points after 10 games last season; they would go 31-32-9 the rest of the way. If he can get healthy and still be dangerous, the Blues won’t have any problem making the playoffs for the first time since 2009. Calgary Flames – Will Jay Bouwmeester be the man on defense? The Flames have said goodbye to two franchise defensemen the past two years in Dion Phaneuf and Robyn Regehr leaving Bouwmeester as the top gun on the blueline. A defense that finished 19th last year lost its best shutdown guy making Bouwmeester’s performance this season even more crucial. He has improved in his own zone since he came into the league, but now he is going to have to put that together with a steady first pass out of the zone and points on the board. Colorado Avalanche – How does Semyon Varlamov fare behind a weaker team? Varlamov has had good stretches in Washington and Avalanche management truly believe he is the answer in goal. But he is going from a strong club that finished ninth in shots against last year to a team that finished 23rd, so he will see a lot more rubber headed his way. He will also shatter his career high of 27 games played so how he handles a greater onslaught of shots will determine if Colorado misses the playoffs in consecutive seasons for the first time since 1992 when the team was in Quebec. Edmonton Oilers – Does Taylor Hall pick up where he left off? Hall looked like he was getting into a groove last season when he engaged in a needless fight with Derek Dorsett of the Columbus Blue Jackets on March 3. 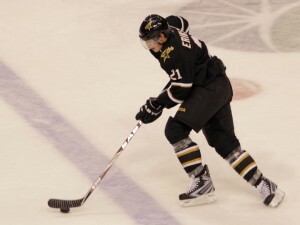 His season ended there with a high ankle sprain just as he was starting to creep into Calder Trophy talk. Expectations in Edmonton aren’t great this year, but improvement is certainly on the radar. Hall can start leading the club back to respectability if he can get back where he was and ramp it up a notch, he will make this rebuild go by much quicker. 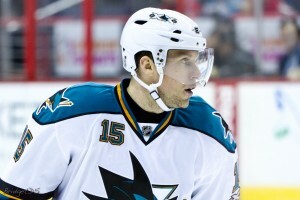 Minnesota Wild – Is Dany Heatley a go-to guy? Now he has to take over the role left by Gaborik as the team’s top source of offense. His goal totals have steadily declined since the lockout and he will need to get back to 40-goal range for this team to have a shot. To do that he’ll have to buy into a team-first concept and score key goals consistently. It’s time to see if he can be a goal scorer without the help of superstar linemates. If he can’t, it’ll be a third straight season out of the playoffs for Minnesota. Vancouver Canucks – Will they stay healthy? What can you ask about a team that finished first in NHL standings, goals for, goals against and power play and only missed out on a Stanley Cup because of a few key injuries and a white-hot Tim Thomas? If their lineup is at 100%, there is no reason they shouldn’t have the same dominant season this year. Ryan Kesler, who recently got off crutches, had a tremendous series against the Predators, but him impact was diminished after being injured in the Western Conference final. Mikael Samuelsson, Mason Raymond and Dan Hamhuis also missed the end of the playoffs with various injuries so if they can all come back healthy, there will be no reason to expect a drop in the standings. Anaheim Ducks – Who provides depth scoring if Teemu Selanne doesn’t return? Reports say Jonas Hiller is over his vertigo, so combining that with an improving defense and the best line in hockey, the Ducks look pretty good. But should Selanne decide to retire, the 11th ranked offense from last season will surely drop. They are dangerously thin after the Perry-Getzlaf-Ryan line as their next best offensive players hardly keep goalies up at night. Saku Koivu (34 goals in the past two seasons) put up his points playing with Selanne and Jason Blake (32) and Andrew Cogliano (21) don’t do an adequate enough job. Surely they are waiting to hear Selanne’s decision, but with nearly $12 million in cap space, there is plenty of room for another depth scorer. Dallas Stars – Does Loui Eriksson keep trending upwards without Brad Richards? Brad Richards meant a lot to the Dallas Stars and even though he is now a member of the New York Rangers, his impact will still be felt. A mentor and linemate to Eriksson the past three seasons, Richards has helped him blossom into two-way forward capable of scoring 30+ goals a year. Now that he doesn’t have one of the top playmakers feeding him passes, Eriksson will have to work even harder if he wants to raise his point total for the fifth consecutive season, especially if Michael Ryder takes the right spot next to Mike Ribeiro. Los Angeles Kings – Will Dustin Penner reach his potential? The Kings have just about got it trying to build a Stanley Cup contender. But they are going to need a much better effort from Penner if they wish to best the rest of the West come playoff time and three goals in 25 regular season and playoff games isn’t close to cutting it. He will spend all season with world-class center Anze Kopitar so there are no excuses this time around. If he can’t pot 30 goals and be a physical presence, then the Kings are losing a big piece of the puzzle. Fortunately the additions of Richards and Simon Gagne give them other options should Penner continue to underachieve. Phoenix Coyotes – Can Mike Smith possibly carry the Coyotes like Ilya Bryzgalov did? Phoenix not only lost one of the best goaltenders in the league, it did little to improve on offense meaning another seasons of having to win a lot of close games. GM Don Maloney bought in Smith who has never had more than 15 wins in a season to be their savior. While he was 13-6-2 with Tampa Bay last season, his save percentage was under .900 and GAA at 2.90, so no goalie is going to have to perform up to and beyond his capabilities this season quite like Smith will in order to reach the playoffs for the third consecutive season. San Jose Sharks – Can Havlat produce more than Heatley? Sure, the Sharks made the Western Conference final during both of Heatley’s seasons in San Jose, but with only five goals and a minus-9 in 32 games combined, Heatley was hardly instrumental during those runs. Meanwhile Havlat has recorded 12 goals and 28 points in 26 games in his two most recent trips to the playoffs, with the Blackhawks in 2009 and the Senators in ’06. Havlat has more game-winning goals in the postseason and has shown he is a force on a strong team, leading the 2008-09 Blackhawks in regular and postseason scoring. Having just missed out on two runs to the Stanley Cup final, Havlat will be geared up to go into this season playing for a contender.